no chemicals were used in this spreader. Us grandmas like to know things like that! Love the title of the post and love the picture in the post--too cute! Love the title and love the picture--so sweet! What a sweet picture, Angela!! Have a wonderful weekend. Love & blessings from NC! Awww. My J. 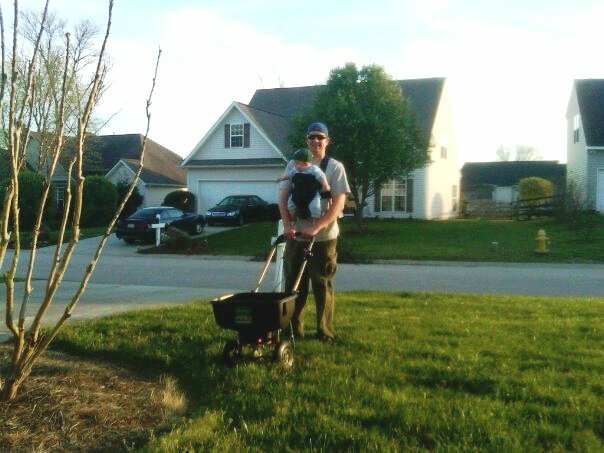 Needs to fertilize this weekend...maybe I should suggest him strapping on one of ours! Hee! I so remember the day that BIG BOY was born. My first grandchild! And now he is holding my great-grand son. How beautiful is that? He's got that boy tucked up close to his heart. So precious. too sweet! Love your blog. Wordless Wednesday/Baby B Is Five Months Old!! !